What is this key? Come to Puppet Cinema for Puppets this Saturday during gallery hours (11 AM-5 PM) to find out who’s who in Twin Cities puppets. The installation is also open one hour prior to all performances of The Devil and Mister Punch (a Work-in-Progress) (tonight through Saturday). Over 120 puppets made by over a dozen puppeteers have been installed in the McGuire Theater. Watch a short film with the puppets or take advantage of the designated photo ops. 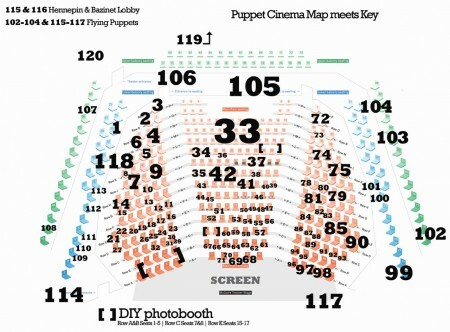 When’s the next time you’ll get to watch a movie with a theater full of puppets? All year the Walker’s been doing the Adventures in New Puppetry series. They approached Bedlam way back-a-when about co-presenting the final installment in the series: Improbable‘s Punch show. At first the answer was pretty straightforward – have it at BEDLAM – that would automatically wild it up, set the social tone for the art and the audience. It was all set, but shazbang, then Bedlam goes and closes its venue last fall. The Walker said, hell, we STILL want you involved, wild it up, set a social tone OVER HERE. The Devil and Mr. Punch it was felt, for numerous reasons, would be well served by a more intimate audience, to get you closer to the action, keep it tight. This drove the idea to seat the audience on the McGuire stage up close with the Mr Punch show. That left the CHAIRS in the McGuire empty. That’s a lot of space. Next week, you’ll have to go back to enjoying puppets on stage or seeking out the storage and stashes in separate studios all over town. For now, enjoy Puppet Cinema for Puppets and celebrate the vast talent of the TC puppet scene.